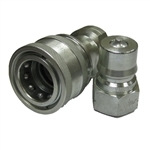 The Series B ISO hydraulic quick disconnects are great all-around general purpose fittings that provide reliable use, high interchangeability and consistency across several industries. 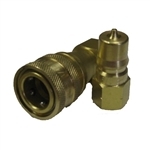 You will often find ISO B quick disconnects used in portable machinery, construction equipment, ag and other demanding hydraulic applications. Hose and Fitting Supply stocks all the key components to make up your ISO B quick disconnect fitting, including sockets, plugs, caps and kits. Shop hydraulic hose ISO B quick disconnects with us today!